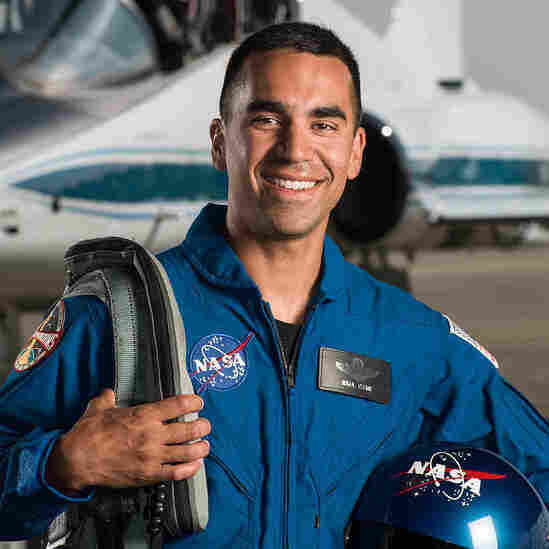 Meet NASA's New Astronaut Candidate Class Of 2017 This year was one of the most competitive applicant pools in the agency's history. 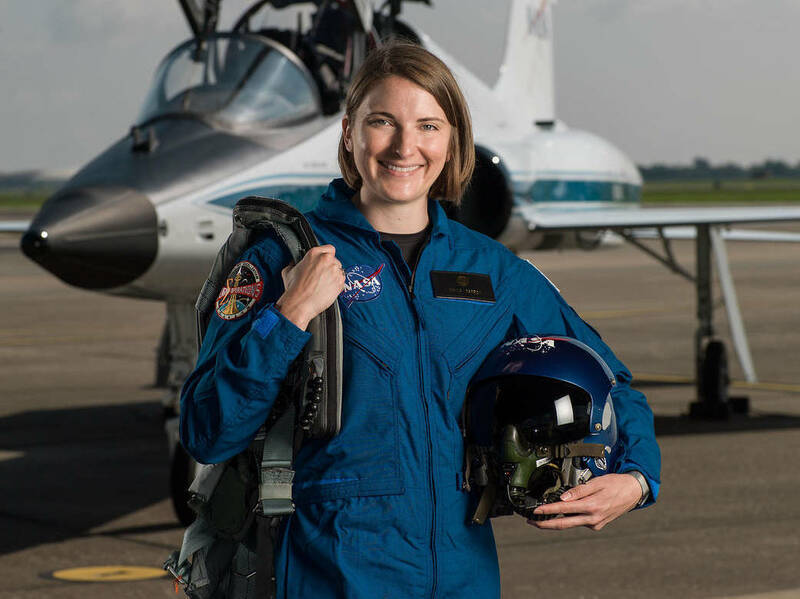 One of the candidates explains what it takes to earn a coveted spot — and why so many want to be an astronaut today. 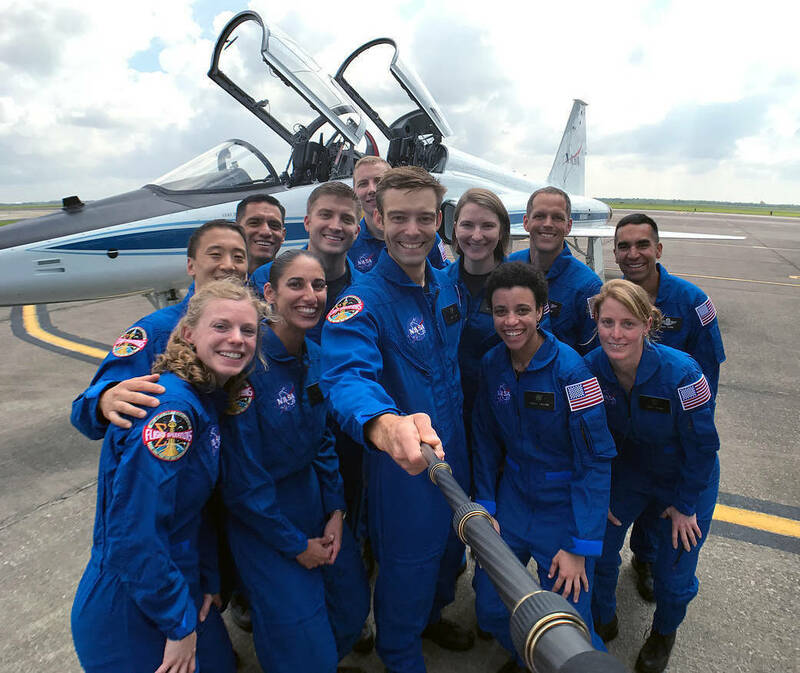 NASA's 2017 astronaut candidates round up for a group photo on Tuesday at Ellington Field near Johnson Space Center. The 12 pictured are, front row, left to right, Zena Cardman, Jasmin Moghbeli, Robb Kulin, Jessica Watkins, Loral O'Hara; back row, left to right, Jonny Kim, Frank Rubio, Matthew Dominick, Warren Hoburg, Kayla Barron, Bob Hines and Raja Chari. Just as class lets out for the summer across the country, a new one has just been announced. NASA has chosen 12 people from a pool of more than 18,300 applicants for two years of training before giving them the title of "astronaut." The space agency received a record number of applicants after announcing an open application in December 2015. 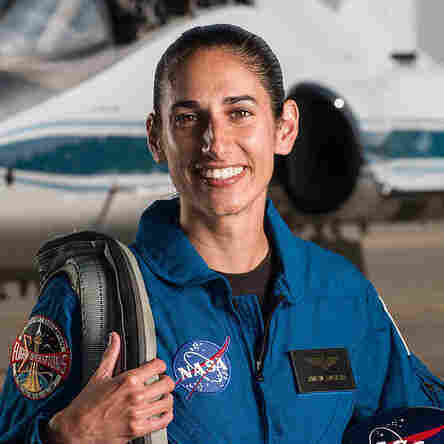 Jasmin Moghbeli, one of the dozen candidates, spoke with NPR's Lulu Garcia-Navarro from Houston's Johnson Space Center, where she'll undertake the training program starting in August. Moghbeli, who says she's wanted to be an astronaut since the sixth grade, talked about what kind of candidate it takes to earn the coveted spot. "Start looking into science, technology, engineering, math, those kinds of fields," the German-born, New York native says. But whatever you do, she says, love it. "There were many other applicants that applied who were extremely qualified for this position that aren't lucky enough to be sitting up here like I am," she adds. "So make sure you're doing what you love. If I did not get the call saying, 'Hey can you join us here at NASA?' I still would've been extremely happy in the career that I was in." "You are the 12 who made it through, you have joined the elites, you are the best of us," Vice President Mike Pence said at a ceremony introducing the candidates Wednesday. "These are 12 men and women whose personal excellence and whose personal courage will carry our nation to even greater heights of discovery." 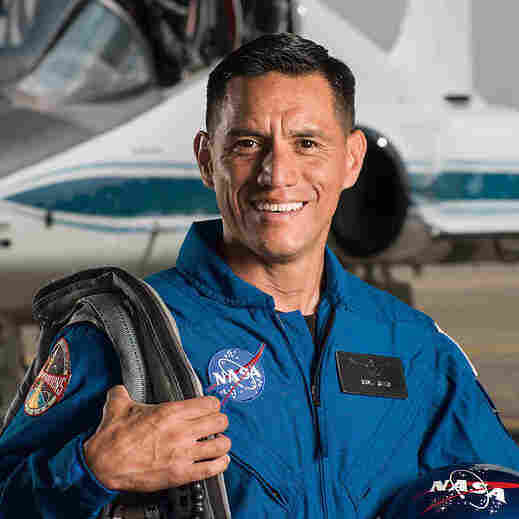 Current and alum NASA astronauts welcomed the newest class in a video last week. You can find the full biographies of each new class member on NASA's site, or meet the candidates below the interview highlights. NPR radio producer Malika Gumpangkum and editor Ed McNulty contributed to this report. It starts out a little underwhelming — you just submit your resume on USAjobs[.gov] and, in addition to that, just my summary of my aeronautical experience — so basically my piloting time. So that's the first step, as I said, very simple. But then from there, they select highly qualified applicants and send reference forms out to you, five of your references — and then that's where it got interesting. They slimmed it down to 120 applicants and they brought us in in groups of 10. The first round was three days of interviews — you know, only three days I could say I got so close to that group of nine other people and we still keep in touch. And then, the final round, they pair it down to 50 people, and again, 10 at a time, but this time it's a week-long process. So you can imagine, you get really close with the other applicants, and I left that thinking: Wow, I want this job even more, based on the incredible people I've met, both at NASA and the applicants, but also thinking: if I don't get it, someone very deserving will get it, 'cause every single one of them had a very impressive resume. First they asked, three words friends would use to describe me, which, I didn't have a problem with that, but then they asked one word I would use to describe myself, and I don't know, it's just tough to pick one word. And out of nowhere I said, "intense," and I think I was just feeling intense in that moment in the interview, but I don't know that that's really the single word I would use to describe myself. I did a book report on Valentina Tereshkova, the first female in space, got to dress up like her in school for a day. I'd always been interested in science, math, technology, that sort of thing always drew me in. And, added to that, the sense of adventure and exploration, you know, I thought space exploration was the coolest thing. So yeah, I've wanted to do this for a very long time. I think it's one of those things that ignites our imagination. I remember when I was a kid in history class, reading about the explorers who would travel across the ocean and discover new continents and, you know, different worlds to them at the time. And this is kind of our modern-day version of that. We're going off and exploring where we've never been before. One, the teamwork at NASA, I think people are pretty familiar with NASA's record and the incredible things that have been accomplished here. And it's just really impressive to see — when you bring a group of smart, hardworking people together — what you can accomplish. So, I think all those things get people excited and that's why it's almost like, even as an adult, gets you excited like a little kid. There are a lot of things on the horizon right now, I know learning about the systems on the [International] Space Station will be part of our training over the next two years. But they're training us, and like I said, there's a possibility of a range of missions that we could go into. Right now, both Boeing and SpaceX are working on commercial crew vehicles — the CST-100 Starliner and the Dragon vehicle. ... And then NASA itself is working on the Orion. So, a lot of new, exciting things coming up that we could potentially be doing in the near future. ... If they could assign me any mission, I'd be overjoyed. That is one of the most exciting things about this job for me. Not just exploring space and that stuff but also getting the message out to the younger generation and getting them excited. If they can see someone similar to them that they can relate to more, then it makes it all that much more possible in their minds to imagine them doing this as well. So, to them I say, do what you love and do it well. Moghbeli earned a bachelor's degree in Aerospace Engineering with Information Technology at the Massachusetts Institute of Technology, followed by a master's degree in Aerospace Engineering from the Naval Postgraduate School. She's also a noted graduate of the U.S. Naval Test Pilot School and has flown more than 1,600 hours and completed 150 combat missions. At the time of her selection, Moghbeli was testing H-1 helicopters and serving as the quality assurance and avionics officer for Marine Operational Test and Evaluation Squadron 1 of the U.S. Marine Corps in Yuma, Ariz.
She graduated from the U.S. Naval Academy with a bachelor's degree in Systems Engineering, followed by a master's degree in Nuclear Engineering at the University of Cambridge. As a submarine warfare officer, Barron was part of the first class of women hired to the submarine community. She's currently the flag aide to the superintendent at the U.S. Naval Academy. Cardman earned a Bachelor of Science in Biology and Master of Science in Marine Sciences at the University of North Carolina, Chapel Hill. The National Science Foundation Graduate Research Fellow is finishing her doctorate at Pennsylvania State, where she studies microorganisms in caves, deep sea sediments and other subterranean environments. 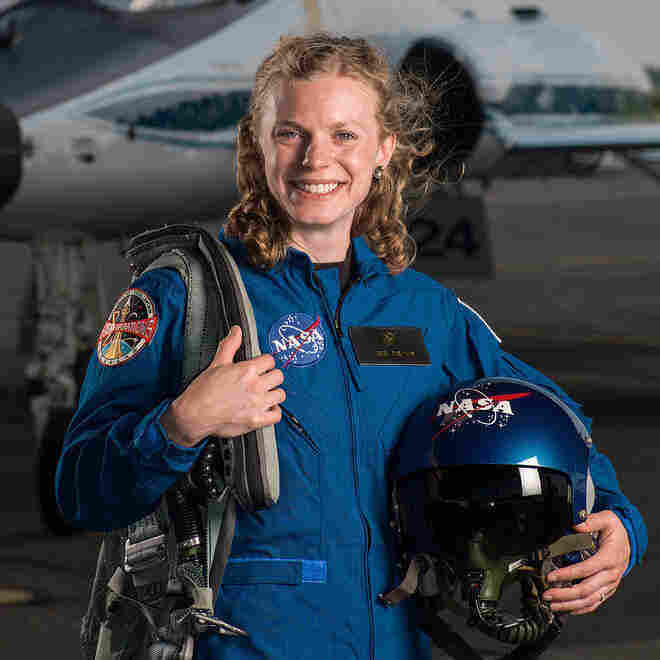 Her fieldwork includes multiple Antarctic expeditions working as a scientist aboard research vessels, as well as NASA analog missions across North America. 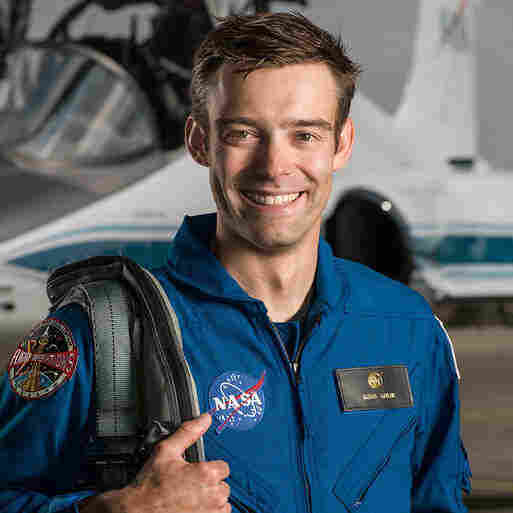 He graduated from the U.S. Air Force Academy with bachelor's degrees in Astronautical Engineering and Engineering Science, before earning a master's degree in Aeronautics and Astronautics from Massachusetts Institute of Technology. He also graduated from the U.S. Naval Test Pilot School, and now serves as the commander of the 461st Flight Test Squadron and the director of the F-35 Integrated Test Force at California's Edwards Air Force Base. Dominick earned a Bachelor of Science in Electrical Engineering from the University of San Diego and a Master of Science in Systems Engineering from the Naval Postgraduate School. He also graduated from the U.S. Naval Test Pilot School. Dominick was at sea on the USS Ronald Reagan, heading the Strike Fighter Squadron 115, when he was selected as a candidate. 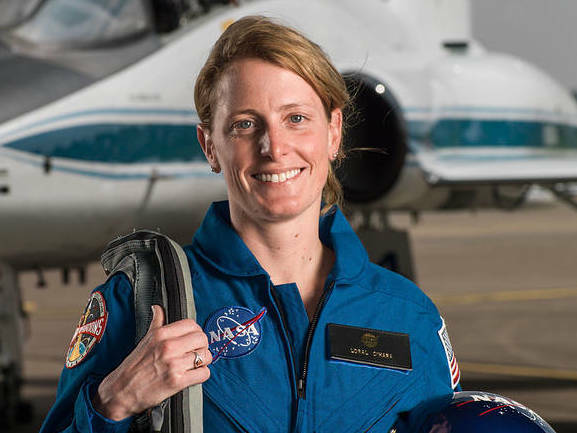 The NASA research pilot earned both a bachelor's (Boston University) and master's degree (University of Alabama) in Aerospace Engineering. He's also a graduate of the U.S. Air Force Test Pilot School, and has served in the Air Force and Air Force Reserves for 18 years. 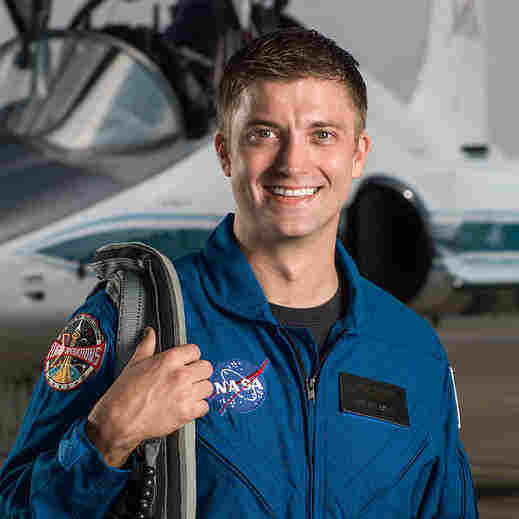 Hoburg got his bachelor's degree in Aeronautics and Astronautics from the Massachusetts Institute of Technology and earned a doctorate in Electrical Engineering and Computer Science at UC Berkeley. 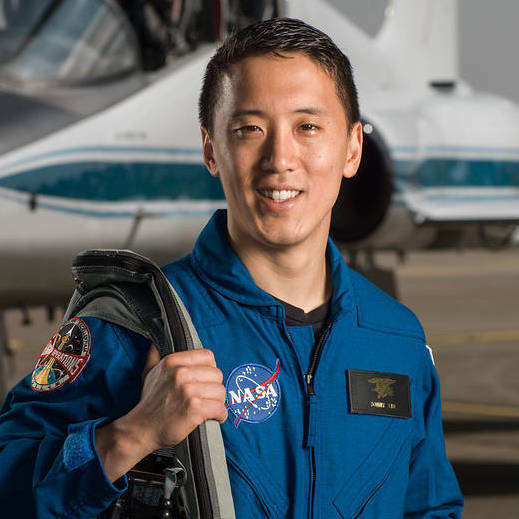 He comes to NASA from MIT, where he's an assistant professor of Aeronautics and Astronautics. The Navy SEAL has completed more than 100 combat operations, earning a Silver Star and Bronze Star with Combat "V." He went on to earn his Mathematics degree at the University of San Diego and his doctorate at Harvard Medical School. The Fulbright fellow earned a bachelor's degree in Mechanical Engineering from the University of Denver, a master's degree in Materials Science and a doctorate in Engineering at UC San Diego. Also a private pilot, Kulin has experience as an ice driller in Antarctica, and as a commercial fisherman in Chignik, Alaska. 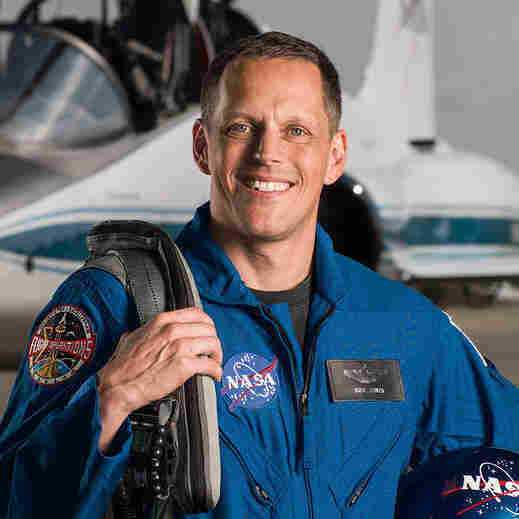 He comes to NASA from SpaceX in California, where he's senior manager for flight reliability, heading the Launch Chief Engineering team. 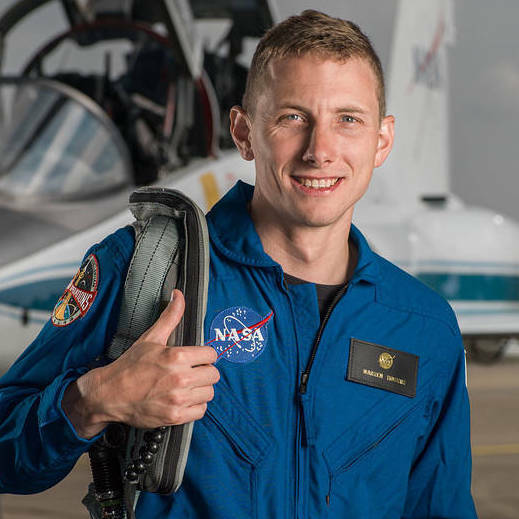 The certified EMT and private pilot earned a Bachelor of Science degree in Aerospace Engineering at the University of Kansas and a Master of Science degree in Aeronautics and Astronautics from Purdue University. 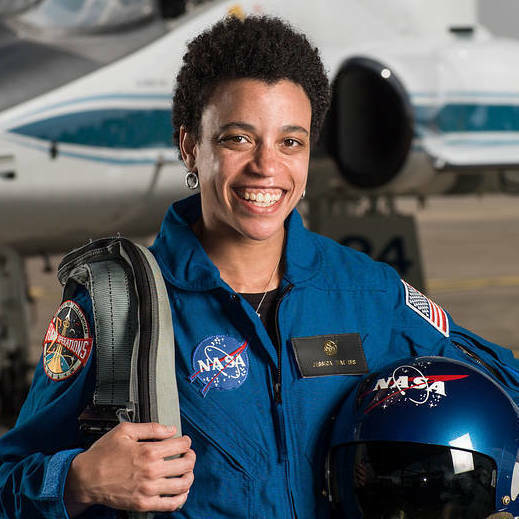 As a student, she participated in NASA's KC-135 Reduced Gravity Student Flight Opportunities Program, at NASA's Goddard Space Flight Center, and interned at the agency's Jet Propulsion Laboratory. O'Hara also spent four years working on design and engineering to upgrade Alvin, the human-occupied deep-sea submersible. At the time she was selected for the candidacy program, the research engineer was working at Woods Hole Oceanographic Institution in Massachusetts. The father of four graduated from the U.S. Military Academy with a bachelor's degree in International Relations and the Uniformed Services University of the Health Sciences with a Doctorate of Medicine. He's flown some 1,100 hours as a UH-60 Blackhawk helicopter pilot, with more than half of that time in combat during deployments to Bosnia, Afghanistan and Iraq. Also a certified family physician, Rubio was working as a battalion surgeon for the 3rd Battalion of the 10th Special Forces Group (Airborne) of the U.S. Army when he was selected as a candidate. Watkins earned her bachelor's degree in Geological and Environmental Sciences from Stanford University, where she also played for the school's rugby team. She went on to get a doctorate in Geology at UCLA, where she taught and studied landslides on Earth and Mars. Watkins' previous NASA experience includes internships at the agency's Ames Research Center and Jet Propulsion Laboratory. At the time she was selected for the astronaut training program, she'd been working with the Mars Science Laboratory's rover, Curiosity, as a postdoctoral fellow in the Division of Geological and Planetary Sciences at the California Institute of Technology.